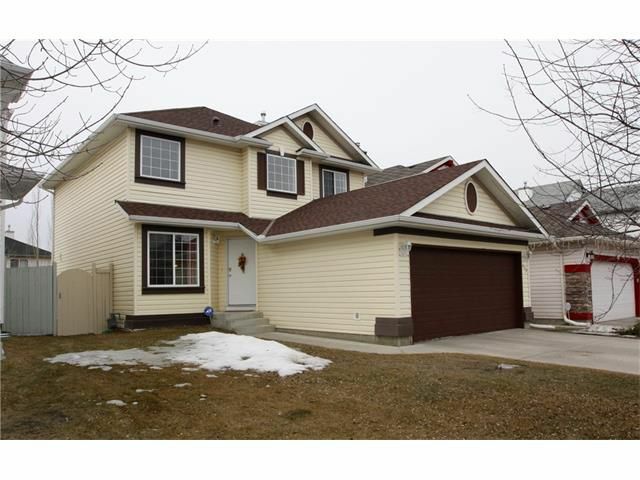 This gorgeous well maintained 2 storey home welcomes you in with a fresh coat of paint, new carpet, & tiled flooring! The main floor offers a formal dining room, laundry, living room with a centered fireplace, & an open concept kitchen that features brand new SS appliances. Patio doors off the breakfast nook provide access to the spacious south facing deck & patio. The master retreat can easily accommodate a California King sized bed & the 4pc en suite has a glass surround shower, corner tub with jets, & a large walk in closet. 2 additional bedrooms, 4 pc bath, & a linen closet complete the upper floor. Mature trees offer privacy & shade in the south facing back yard. Additional/recent upgrades to the home include a new roof (2015), central vacuum (canister in garage for reduced noise), tiled flooring (2012), stainless steel appliances, paint & carpet (2017). This home is conveniently situated on a family friendly cul-de-sac that is walking distance to schools, green spaces, playgrounds, & a daycare. Proximity to the C-Train & all amenities is very favorable with this homes location!